In the fall of 2015, it was precisely 10 years ago that Arte and Flamant joined forces to bring out their first ever joint collection. Flamant – The Wallpaper Collection was an unparalleled success and was later followed by other collections under this label. Both Arte and Flamant are extremely proud of this successful collaboration. In order to celebrate this anniversary, we have developed two new collections: Les Unis and Les Rayures. Both of these are a combination of existing colours or designs and new, refreshing elements. The result is two versatile collections that offer a wide range of options for both classic and modern interiors. Les Unis - LinensLes Unis is inspired by the timeless look of linen, a material that has been used to decorate interiors for decades. This wallpaper is as warm and tactile as linen, with the same natural appearance. And, just like linen, it is exceptionally durable and breathable and thus allows the walls to breathe. As the name may suggest, this entire collection is made of plains. The power lies in the colour palette as it encompasses 75 stunning colours, which can be endlessly combined with one another. For the composition of this palette, the designers were inspired by outdoor life. From soft earthy shades, through fresh greens and blue tones, to intense autumnal hues; they can all be found in this collection. Les Rayures - StripesThis name also speaks for itself. The entire collection revolves around one design, stripes. Without doubt, the simplest pattern in the world but one that still offers endless interior styling options. 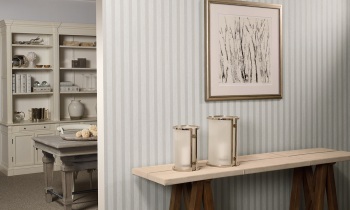 Simply by changing the direction, a stripe pattern can create an entirely different spatial effect. Les Rayures encompasses six different stripe designs and offers a wide range of options for every interior. To add even further variation, the designs use a variety of colour combinations, from subtle tone-on-tone creations to eye-catching contrasts. Each of these patterns can be easily combined with plain colour sections or even other designs from previous Flamant collections.